A while back we introduced our followers to 2ACoin (ARMS) and how mining with your CPU and GPU's could be fun and affordable, once again. 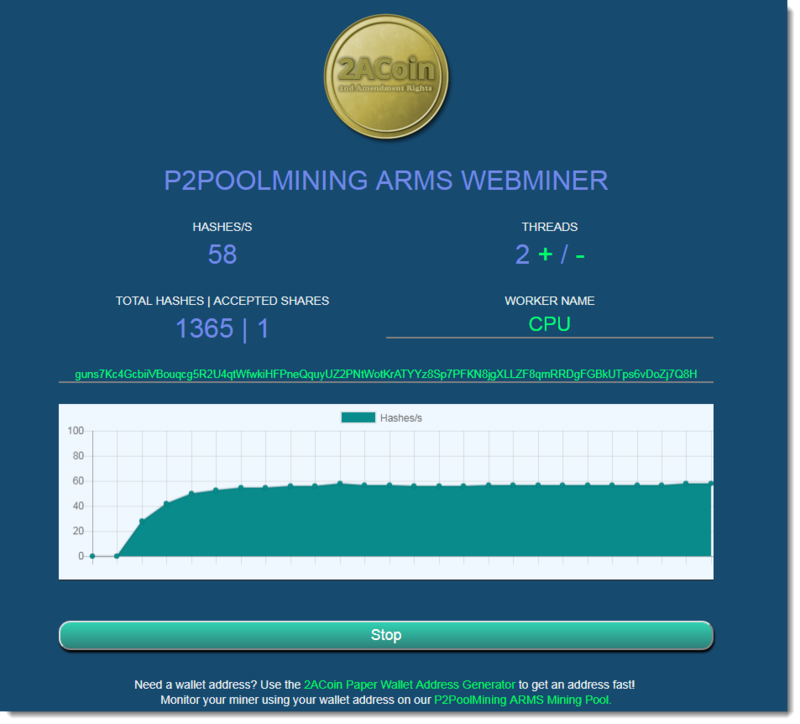 In this post we want to introduce our users to the P2PoolMining.Us Web Miner for mining 2ACoin (ARMS) using nothing but your CPU. First, we want to thank the developers of 2ACoin for making this crypto-currency ASIC Resistant which enables anyone to mine 2ACoin with just a CPU or a GPU Mining rig. You'll need to get a 2ACoin wallet for your mined ARMS to be held in. This whole process shouldn't take more than a couple of minutes, at which point, you are mining 2ACoin ARMS with your computers CPU. Now let's cover some of the advanced features of our Web Miner. You will notice that the Web Miner has the ability to adjust the threads you are mining with. Threads are synonymous with CPU Cores, therefore, the number of threads you see listed is related to the number of CPU cores your system has. By default, the Web Miner will use all available CPU Cores your system has for mining. This is not a bad thing, because you will want to get as many hashes as possible out of your CPU. Hashes equate to ARMS. So the more hashes you have, the more ARMS you will receive. You can use the +/- signs to adjust the threads used by the web miner on your machine. 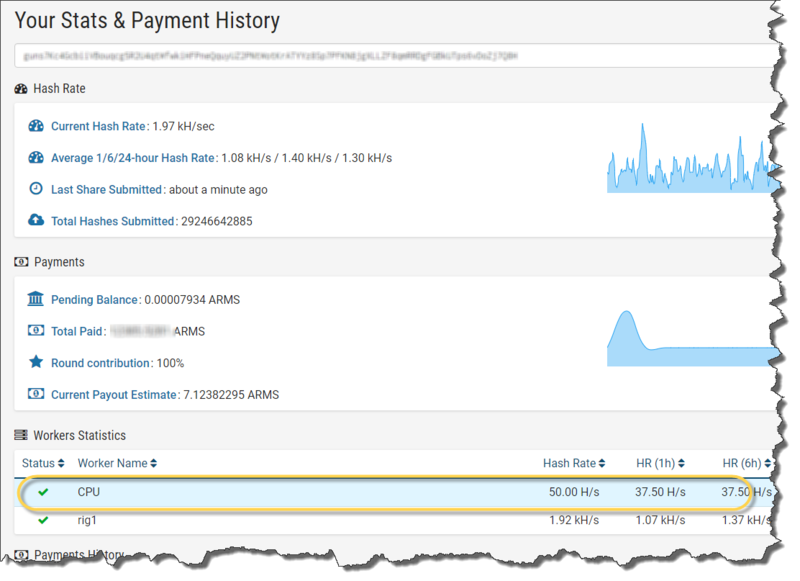 As you make adjustments you'll notice that the Graph Display will change as related to the Hashes your system is producing. NOTE – Using all threads (CPU Cores) available on your system for mining may make your machine run sluggishly. If you need your machine for some other use, consider reducing the number of threads for mining to allow the other processes to have sufficient resources. The web miner interface has some basic monitoring capability. As you can see the web miner provides you with the Hashes per second, Total Hashes and Accepted Shares. In addition, the web miner graphs your Hashes per second over time for a nice visual display of your mining performance. But what if you want more information? What if you have multiple miner's that you want to be able to monitor all at the same time from one single interface? 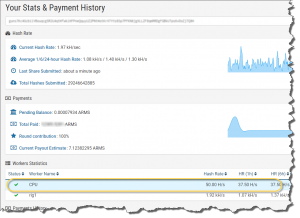 For tracking your miner's performance you can go to our 2ACoin Pool and see the results of your miner and it's performance over time. If you have multiple web miner's running then continue reading the next section on Worker Names. Worker Names enable the display of individual worker statistics. The page should now refresh and show you your individual Web Miner Statistics in the Workers Statistics section on the page. You can see an example in the above image where we have 2 Workers (CPU and rig1) running… and that's all their is to it! In this post we introduced you to our new Web Miner which is designed to allow you to mine 2ACoin ARMS with nothing more than your computer's CPU. 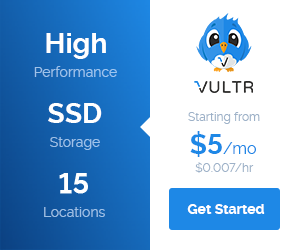 If you already have a computer, and internet access, then you have everything you need to begin mining today! We hope you enjoyed this post and we encourage you to leave your comments and suggestions below.